Self-archiving, the practice of depositing one's works in an OAI-compliant archive, is a key strategy for innovating scholarly communication and achieving open access. DL-Harvest, a subject service for Library and Information (LIS), based on the aggregation of OAI-PMH compliant metadata from both institutional and disciplinary digital repositories, including dLIST, is described. 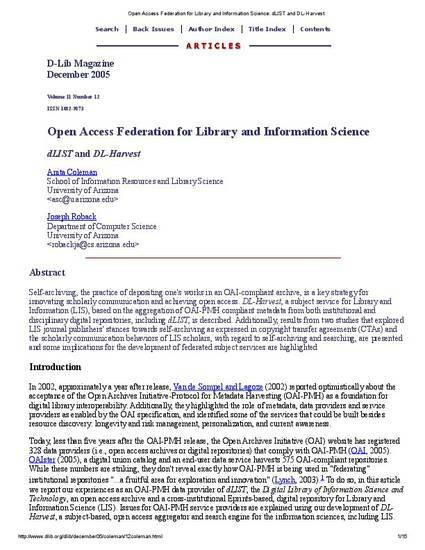 Additionally, results from two studies that explored LIS journal publishers' stances towards self-archiving as expressed in copyright transfer agreements (CTAs) and the scholarly communication behaviors of LIS scholars, with regard to self-archiving and searching, are presented and some implications for the development of federated subject services are highlighted.